Join us for the Way of Love Lenten Study! This Lent, St. Andrew’s is joining Episcopalians across the world, and Presiding Bishop Michael Curry, in exploring seven practices that mark a Jesus-centered life: Turn, Learn, Pray, Worship, Bless, Go, and Rest. Every Sunday morning at 9:00 a.m. during Lent, we will come together as a community for breakfast, fellowship, and a study session exploring what it looks like to follow Jesus authentically in our time. St. Andrew’s Episcopal Church is located at 2404 N. Howard St. in Spokane. All are welcome! Bishop Curry, the first African American leader of the Episcopal Church, captured hearts around the world last year with a stirring sermon at the royal wedding in the United Kingdom. Curry was named Religion Newsmaker of the Year in 2018 for his forceful “power of love” sermon and his passionate, joyous call for the church to embody the love and justice of God; to transform our world, “from the nightmare it often is, into the dream that God intends.” Bishop Curry co-authored the Reclaiming Jesus declaration - “A confession of faith in a time of crisis” - calling on American Christians to, “speak and to act in faith and conscience,” because, “the soul of the nation and the integrity of the faith are now at stake.” He describes our tradition as the Episcopal Branch of the Jesus Movement, a movement of disciples committed to following Christ’s Way of Love in our daily lives, churches, and communities. We are responding to this call by focusing on these essential practices as we approach Easter in anticipation of the transformation to come. Learn more about the Way of Love curriculum on the Episcopal Church’s website! Check back to this page throughout Lent for updates from our study sessions and for helpful resources and materials for those wishing to follow along at home. It was a chilly but beautiful morning in Spokane for our first Way of Love study, and we had a wonderful turnout at St. Andrew’s! In addition to sharing some delicious breakfast casserole, we discussed our own experiences with baptism, explored the meaning of the Easter vigil and early Christian baptismal practices, told stories of forgiveness, and identified ways our own lives are in need of “turning” toward God. “Take time before the next session to write a letter to yourself containing your hopes and prayers for this journey. Imagine that you are starting this time by facing toward the metaphorical West in your life – the habits, beliefs, or behaviors that draw you from the love of God – and make a commitment to TURN away from them. See this as an opportunity to turn to a new way of life with God, which is promised to us in baptism. Bring your letter back, sealed in your self-addressed envelope, to be held onto by the leader until the last session. 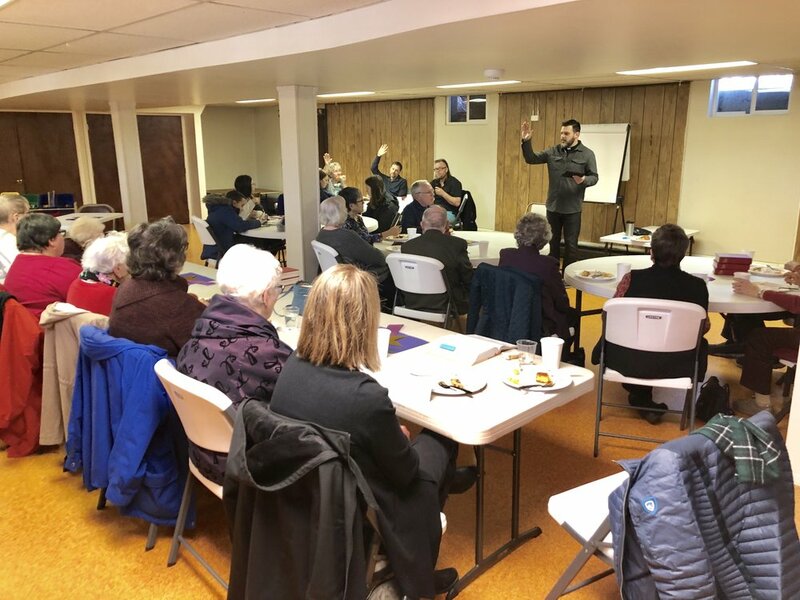 The second week in our Way of Love Lenten series was focused on prayer (not to mention, more incredible breakfast food!). Rev. Jonathan reviewed the different types of “active” prayer laid out in the Prayer Book. We also discussed the opposite form, known as apophatic prayer, which involves listening for God’s call to speak to us! Prayer can even include some forms that might surprise us, from hiking in the wilderness, to “yelling at God” in frustration or disappointment, to the experience of awe and wonder that defies words. Some members commented that the prayers that we perceive as being “unanswered” (at least for a time) can also teach us so much if we are paying attention. We discussed strategies for prayer that have connected with us, and those we find most challenging, as well as the ways in which our prayer lives are in need of renewal in our own personal spiritual lives. All were encouraged to consider more deeply how we might renew our practices of prayer, whether through a structured program or being more conscious in our daily lives. Prayer makes us stop, focus on what matters, and truly notice both the blessings we have received and the ways in which we hope to align our lives and communities with Christ’s Way of Love. More from the Episcopal Church’s Way of Love curriculum, including a ten minute video on the practice of Prayer and Israel’s deliverance at the Red Sea, is available here! How often do you read the Bible and what insights have you gained from it? (Be honest!) This week’s focus in our Way of Love series was on the practice of Learning! Discussion questions focused on the specific areas in our lives where each us of has gained some sort of wisdom. It might be teaching, it be might dealing with pain or struggle, it might be engaging others in civil conversation of difficult political issues. Whatever your “gift,” and even though we may feel a little arrogant thinking of ourselves as wise, each of us has some sort of wisdom to share with the world. What is your wisdom? What aspects of God do you want to gain a greater understanding of? Peace? Grace? Forgiveness? Can you think of a person in your life who might possess the wisdom to help you understand God better? Remember that wisdom does not involve just learning facts - it involves action and integrity. Several members pointed out that ideally, prayer should spur and lead us to wise actions as well. God doesn’t just care about what we think and believe, God cares about what we do, and how we act out our love for others and for the world. Reading scripture is one of the primary ways we gain wisdom, as Christians, and we talked about the importance of not just reading the Bible, but doing the hard work and struggle of understanding the historical context in which it was written in order to truly understand the sacred message it contains! Rev. Jonathan also suggested that in modern America, we tend to want to treat scripture as a machine - we want to pick it apart and analyze its various pieces. However, the purpose of scripture is to teach us! This means we need to spend time truly listening! Jonathan suggested one way to listen better to scripture is to spend time with one reading, to read it three times, pausing each time to focus and listen to what the passage is saying to you. Some members find it very helpful to read one proverb a day in order to reflect regularly on the wisdom of God found in scripture! For more on the practice of Learning from the Episcopal Church Lenten video series, watch this video! All are welcome to experience the warmth, beauty, and wonder of Christmas Eve at St. Andrew's this year, as we mark the birth of Christ in this season of peace, hope, and love. Our “festal service,” meaning celebration or festival, begins at 4:30 p.m. on Monday, December 24th. The service will last approximately an hour and a half. St. Andrew's Episcopal Church is located at 2404 N. Howard St. in Spokane, just five minutes north of Downtown and Gonzaga University. Free parking is available in the parking lot behind the church, on Howard St., or Carlisle St.
You can find our Facebook event here and use it to invite friends and family who may not have a church home, or who haven’t been to church in a while. We look forward to welcoming many longtime neighbors as well as new friends on December 24th. When we say “all are welcome here” - we truly mean it. If you’re interested in helping us decorate the sanctuary for Christmas, please join us for the Greening of the Church on 12/23 at 9:15 a.m. (with brunch! ), followed by a baptism during the 10:30 a.m. service!